Lian Li is no stranger to the case market or the enthusiast community. 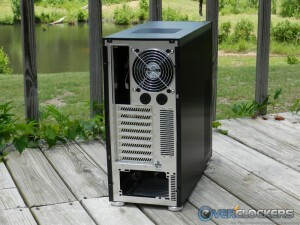 They are known for making some of the highest quality cases available. We present one of the newest additions to their family, the PC-Z60. 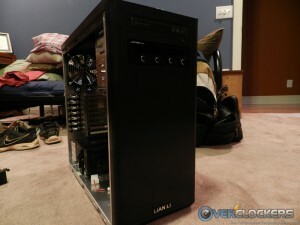 This will be my first experience with a Lian Li case, and I’m anxious to see if their cases live up to all of the praise. 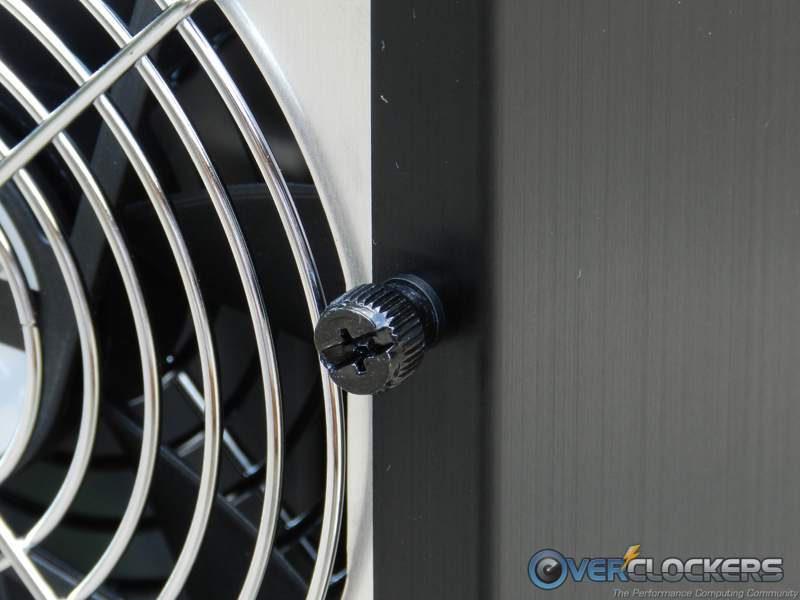 High Thermal Performance – Two 120 mm fans (front) and 120 mm fan (Rear), 140 mm fan (top) keep hot air from damaging your hardware. Supports Up To Six Hot Swap HDDs – Sata hot swap HDD cage, using thumb screws with rubber suspension, supports six 3.5″ HDDs and two 2.5″ HDDs (use one 3.5″ HDD space). Removable Anti-Vibration Fan Mounting – User can choose their fans to face left or right. 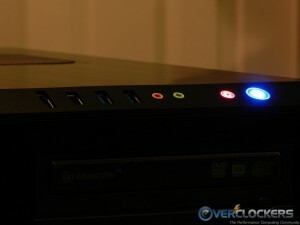 USB 3.0 Multimedia I/O Ports – Users can easily access USB 3.0, USB 2.0, e-SATA and HD Audio ports. 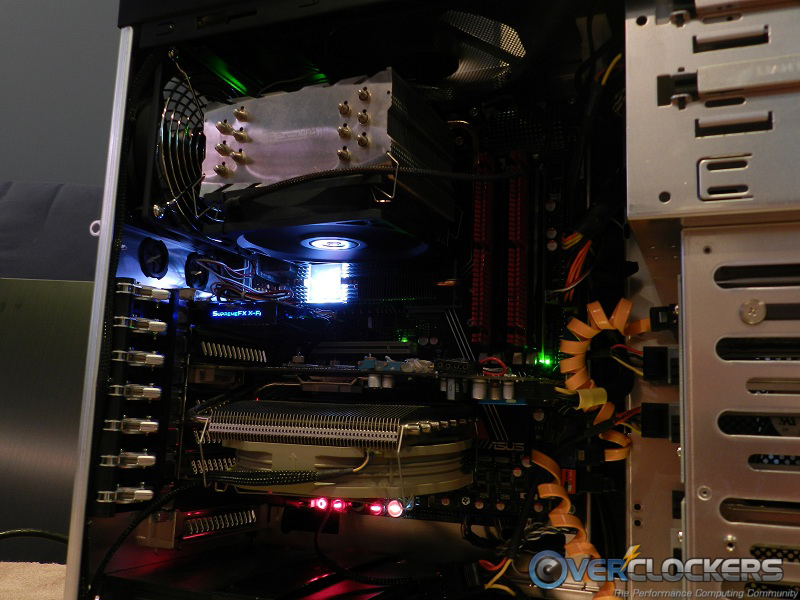 Tool-less PCI Card Holder – Supports eight PCI add-on cards. To install simply lock the arm into position. 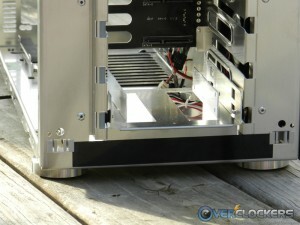 Tool-less PSU Holder – Insert the PSU into position, then close the aluminum PSU holder. 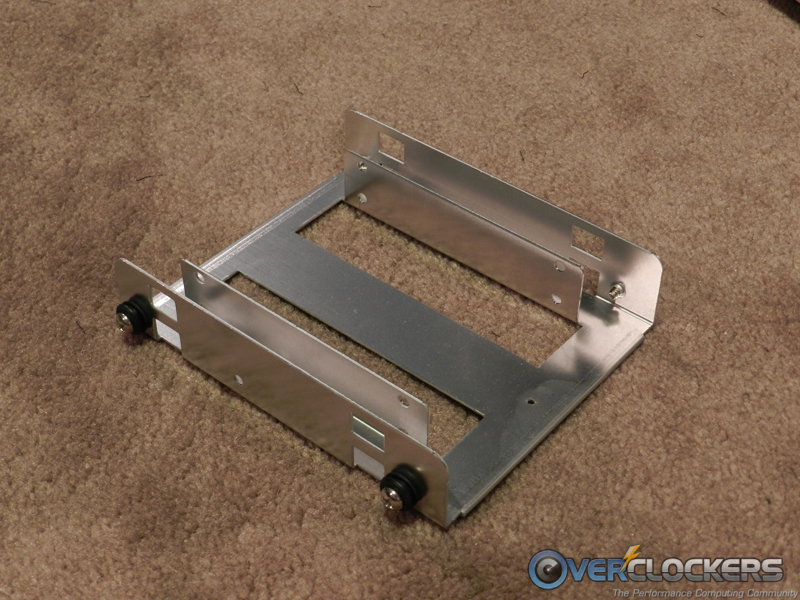 Tool-less Optical Drive Mounting – Supports standard 5.25” optical drives. 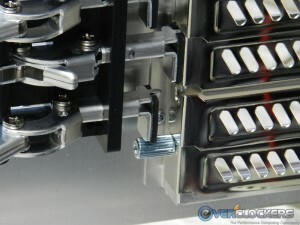 Cable Clamp – Cable management kit for cables to pass through, allow user to conveniently manage the cables. 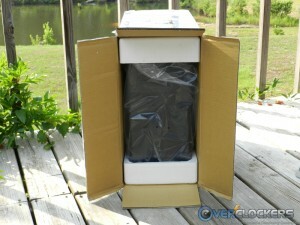 Washable Air Filters – Washable 140 mm air filter (base) and two 120 mm air filters (front/side). 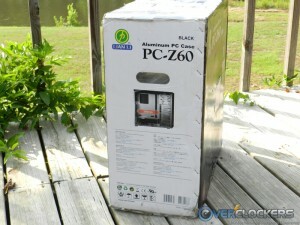 The box displays the PC-Z60 and highlights some of its many features on the front of the box. 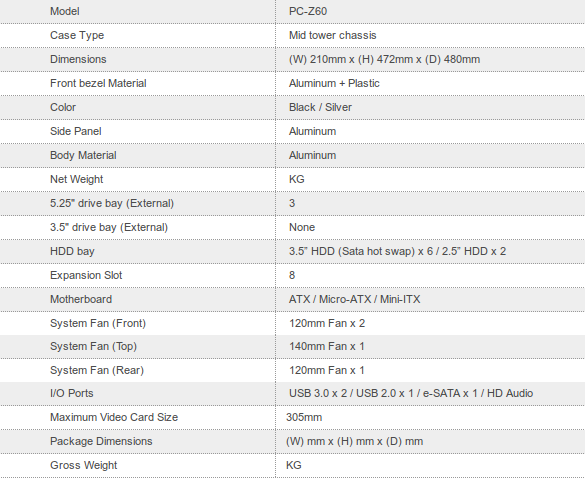 The side shows an interior view of the case and lists some specifications in six different languages. 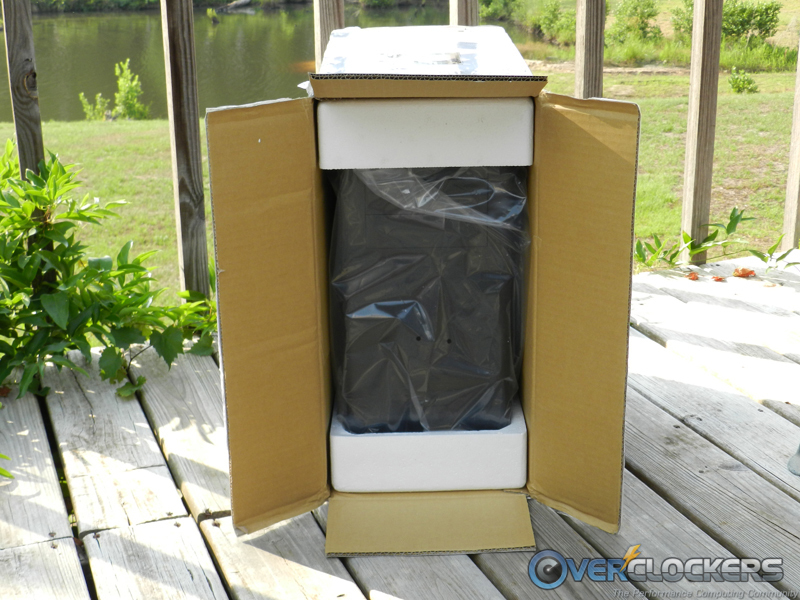 Packaging is typical of most cases, using Styrofoam on the top and bottom to separate the case from the sides of the box to prevent possible damage during shipping. The accessories box comes with a tool-less PSU mounting bracket, hard drive mounting rails, hard drive thumbscrews for the rails, motherboard thumbscrews, assorted screws for 2.5″ hard drives and the PSU, POST speaker and zip ties, and a 20-pin USB3.0 to USB2.0 adapter for the front panel. There are a few out-of-the-ordinary accessories listed like motherboard thumbscrews. Yes, you can use those screws to install the motherboard without a screwdriver; I think that’s a pretty neat feature. 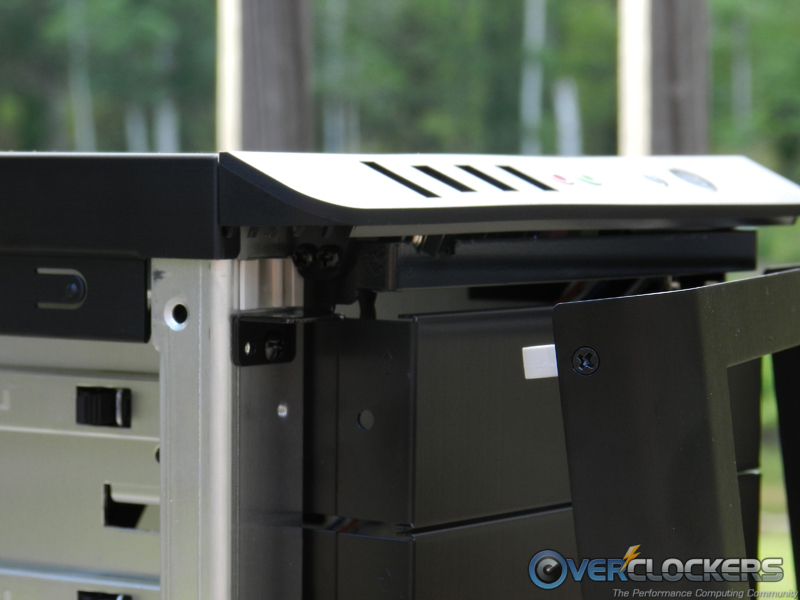 The tool-less PSU mounting bracket means just that; you don’t need any screws or tools to securely mount the PSU. Finally the USB3.0 to USB2.0 adapter is a nice addition allowing those without USB3.0 to utilize more USB ports on the front panel of the PC-Z60. On to the eye candy! 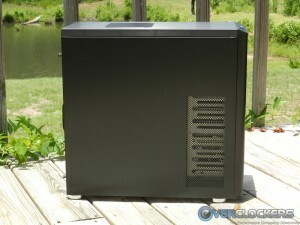 The exterior of the PC-Z60 is very sleek and streamlined like most Lian Li cases. There isn’t a lot going on in the front, it’s all brushed aluminum with spots for three 5.25″ devices and “Lian Li” at the bottom. 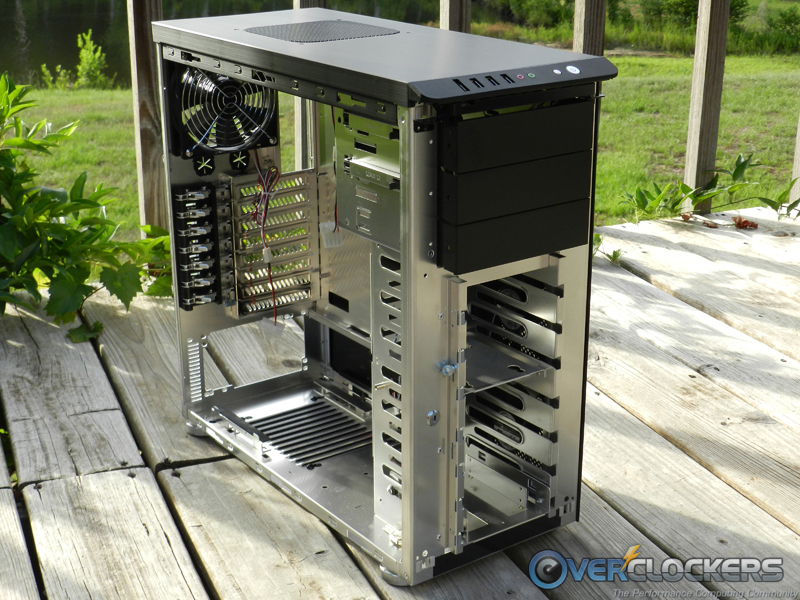 The back of the case is the standard motherboard I/O, 120 mm exhaust fan, a couple of circular cutouts with grommets for water cooling, bottom PSU mount, and eight PCIe slots. However, there are a few details about the back to be mentioned in a minute. 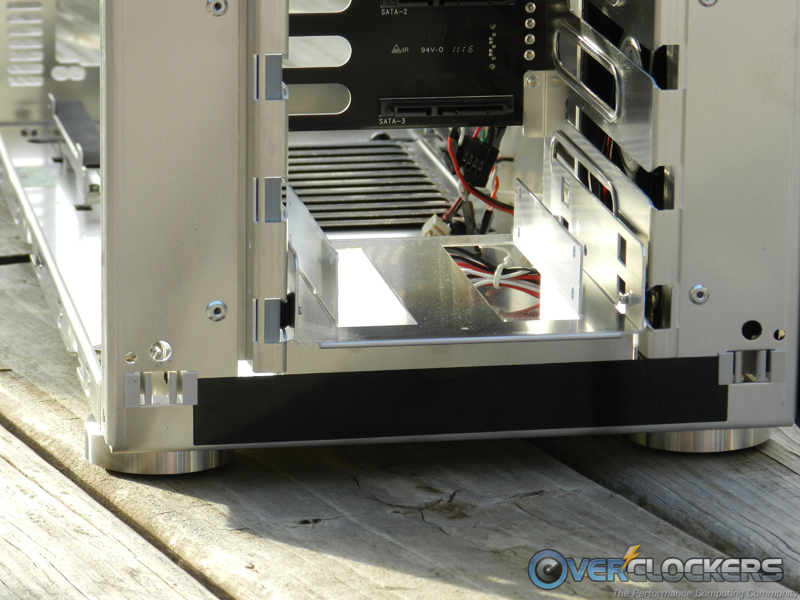 The sides are identical brushed aluminum panels with mesh areas near the front of the case for air. 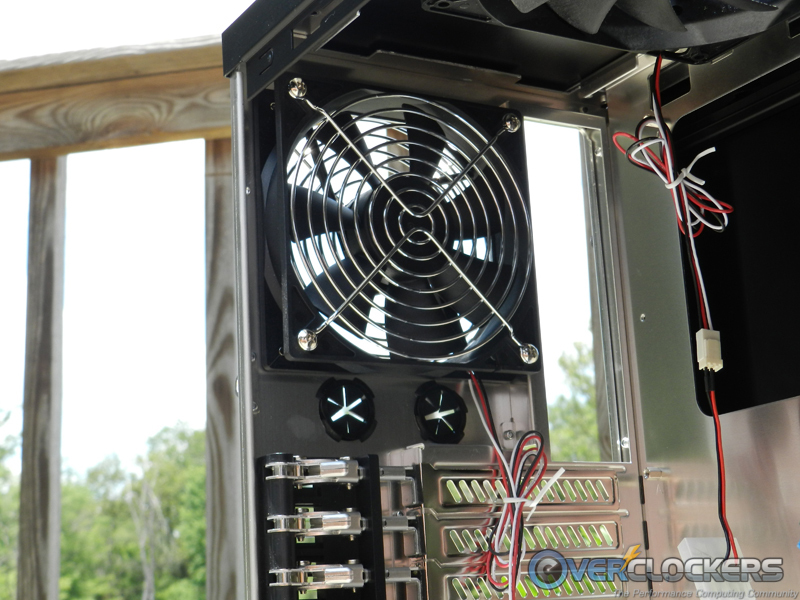 The mesh areas are sized for two 120 mm fans, however, only the right side has an intake fan installed. The top is brushed aluminum as well and it has a spot for a single 140 mm fan. 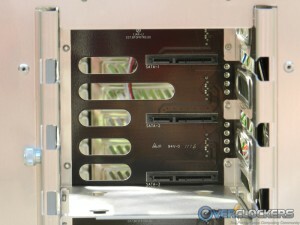 The front panel consists of one eSATA, two USB3.0, one USB2.0, audio I/O, and power/reset switches. 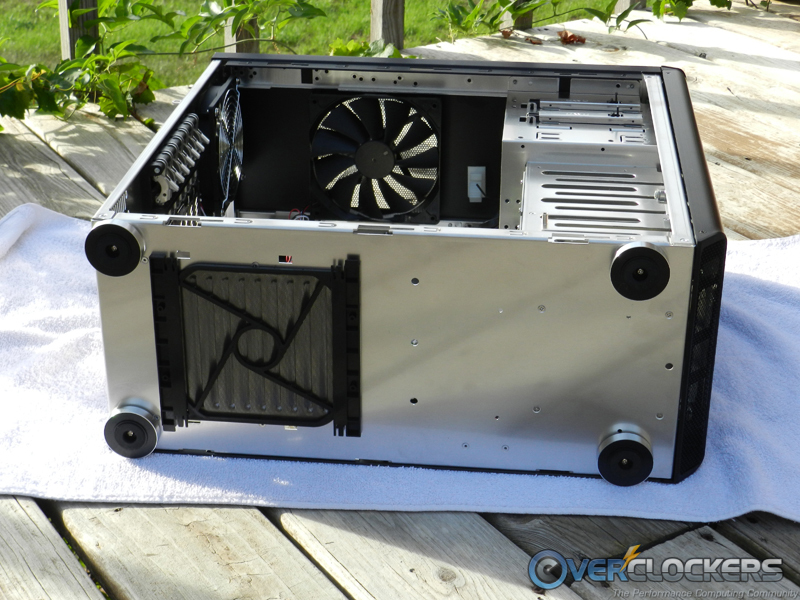 The bottom has four feet to keep the case off the ground so the PSU will have plenty of room to pull in fresh air from underneath. There’s also a fan filter installed over the intake slots to help prevent dust from getting to your PSU. 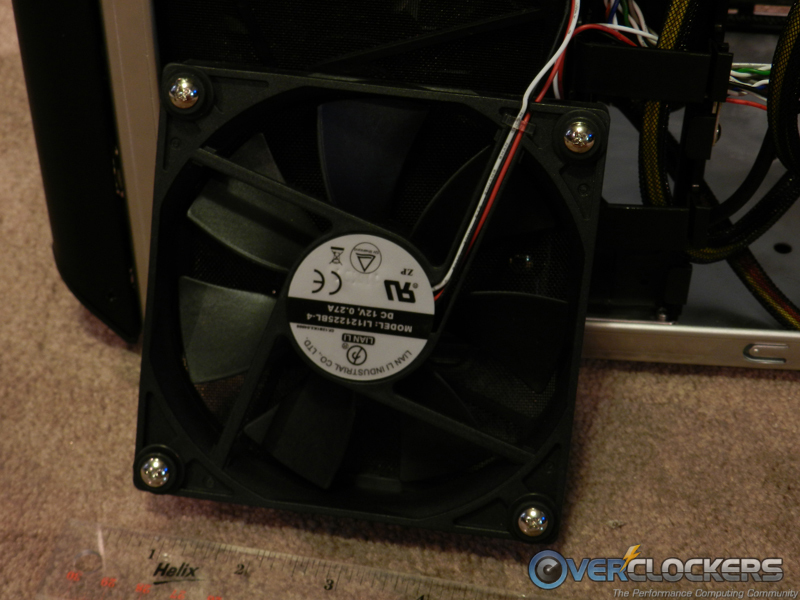 This fan filter can be removed from either side of the case, so it doesn’t matter which side of your desk the case is located, there will be easy access to the dust filter. Let’s take a closer look at the back for a few noteworthy details Lian Li has added. 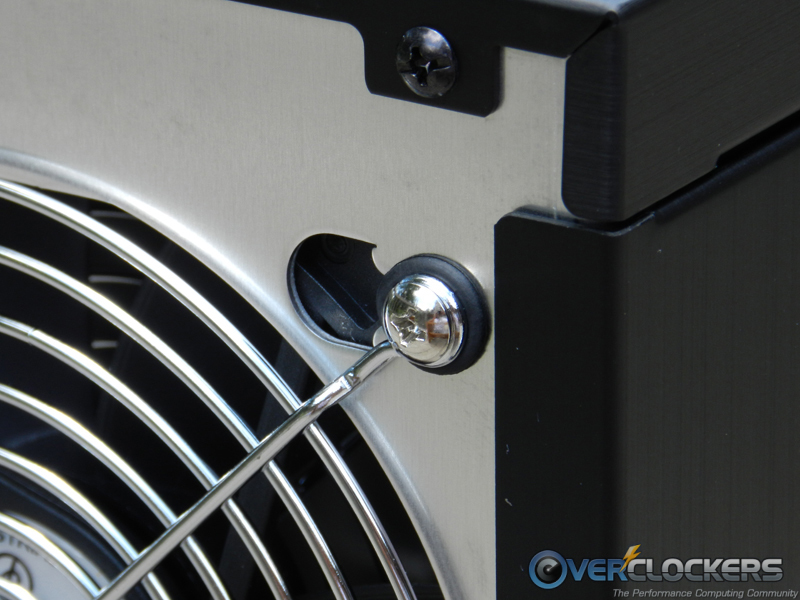 First, notice that the exhaust fan is mounted with rubber grommets to isolate the fan from the case to reduce noise. Next, looking at the side panel thumbscrews, they also have a rubber washer installed to prevent vibration and scratching of the side panel. 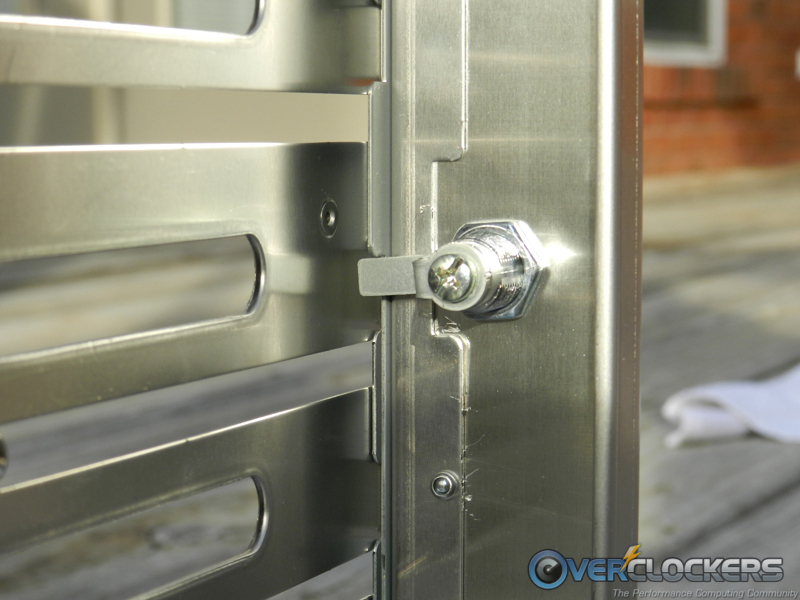 There’s also a protrusion meant for a lock to keep your components safe. Although I hope there wouldn’t be need to worry for a PC in your home, but you never know. Now, on to the guts of the PC-Z60. First up is the exhaust fan. It’s 120 mm and has a grill on the inside as well to help keep wires out of the blades. 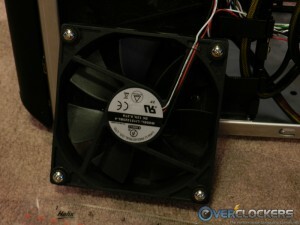 The fan is wired with a 3-pin connector for the motherboard, but it also has a 3-pin to Molex adapter for getting power directly from the PSU. Underneath the fan there’s a strip of tool-less PCIe card locks for use with seven of the eight slots. I’m not sure why the last slot was left out. 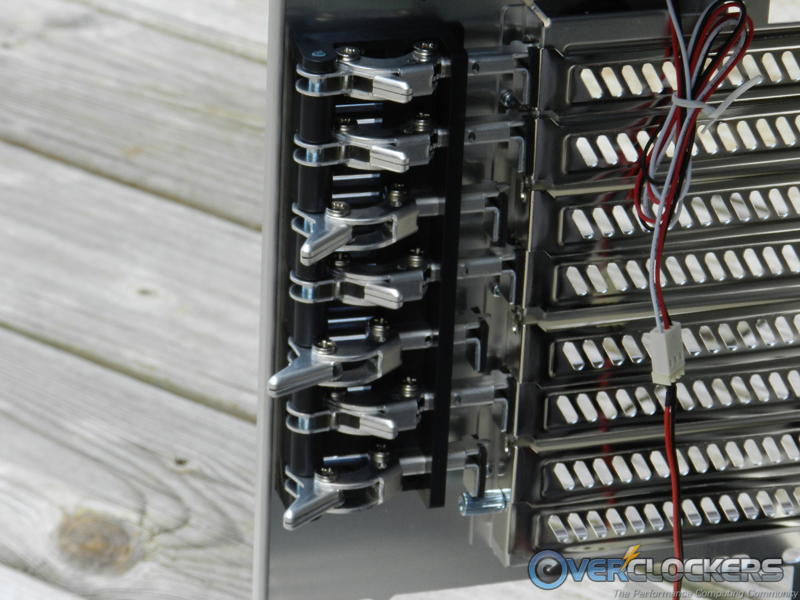 Maybe because these are massed produced to fit in multiple Lian Li cases and an eighth lock would have hindered that versatility? Anyways… the locks are really easy to lock and unlock, it’s almost like flipping a light switch. 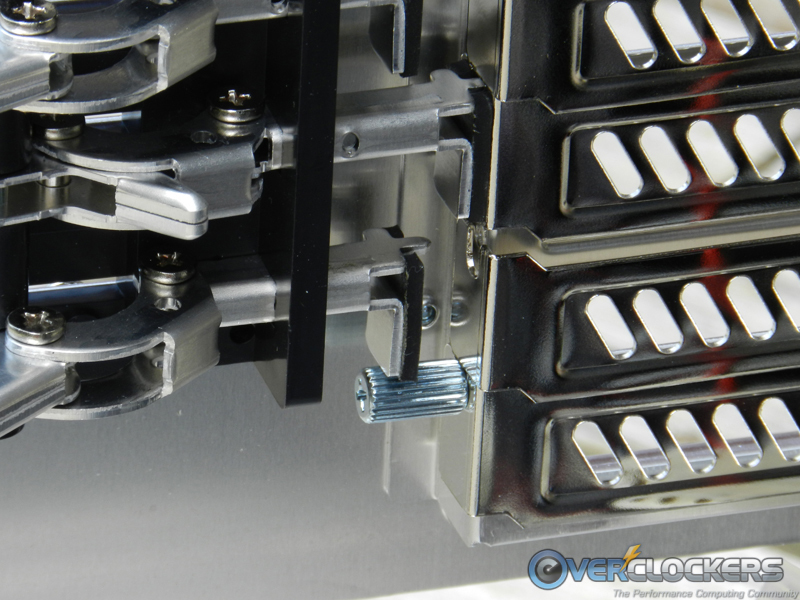 If you take a closer look at how the locks hold the cards in place, you’ll see a small metal extrusion that fits into the screw holes coupled with a rubber pad that pushes against the the PCIe bracket. 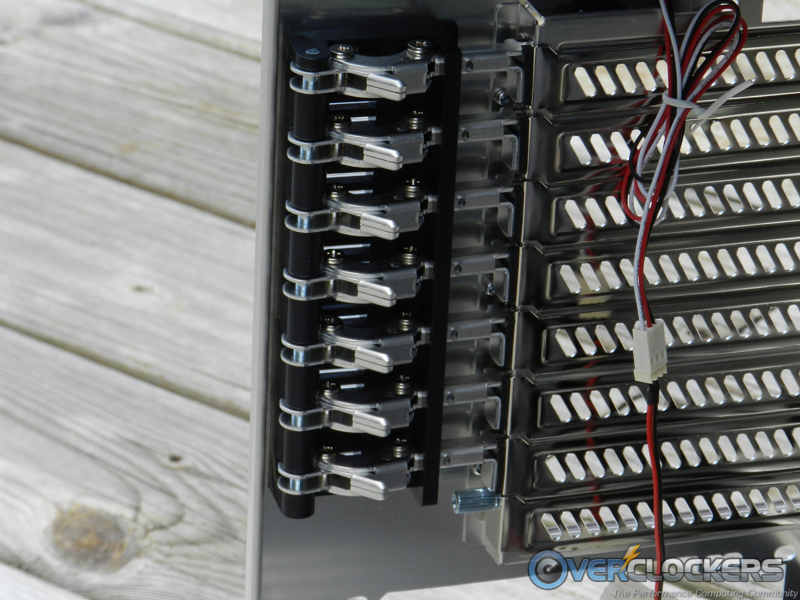 The hard drive cage supports six 3.5″ hard drives and two 2.5″ hard drives. 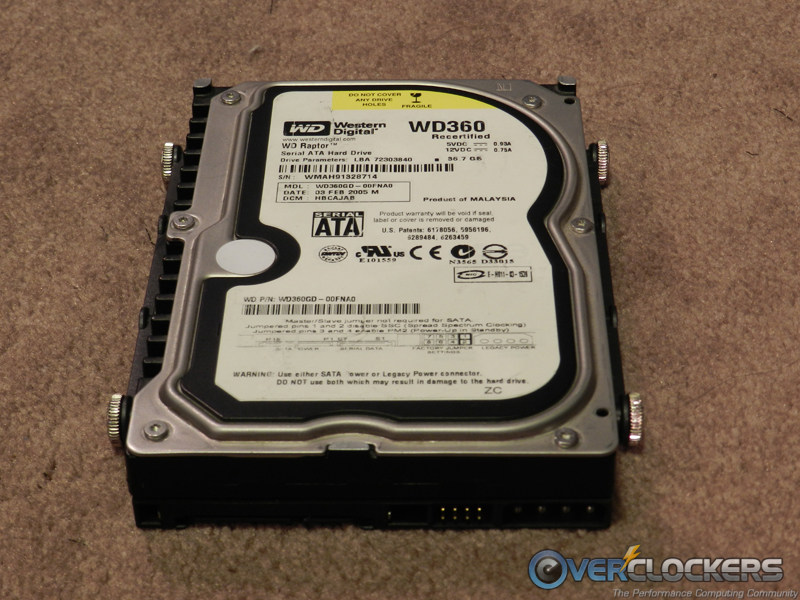 The top six hard drive spots are hot swap 3.5″ spots as can be seen from the pictures below. 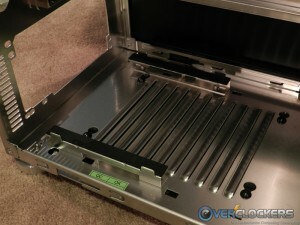 The bottom spot has a hard drive sled for mounting two 2.5″ hard drives, but that sled can be removed and a 3.5″ hard drive can be installed there (it just won’t be hot swap). Something I don’t like about the hot swap hard drive setup is that the Molex power and SATA data cables are tough to hide, but I won’t really be seeing that so it’s not a big deal. However, the SATA adapter boards can be removed from the back of the hard drive cage, the hot swap type installation isn’t required. There’s also a hard drive locking feature in addition to the spot for a lock to secure the side panel. 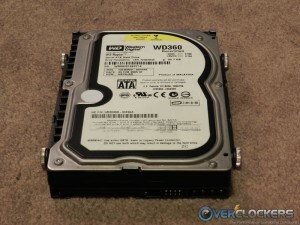 Since the hard drives are hot swap and are installed and removed from the front of the case, a lock on the side panel wouldn’t do much to protect any sensitive data. 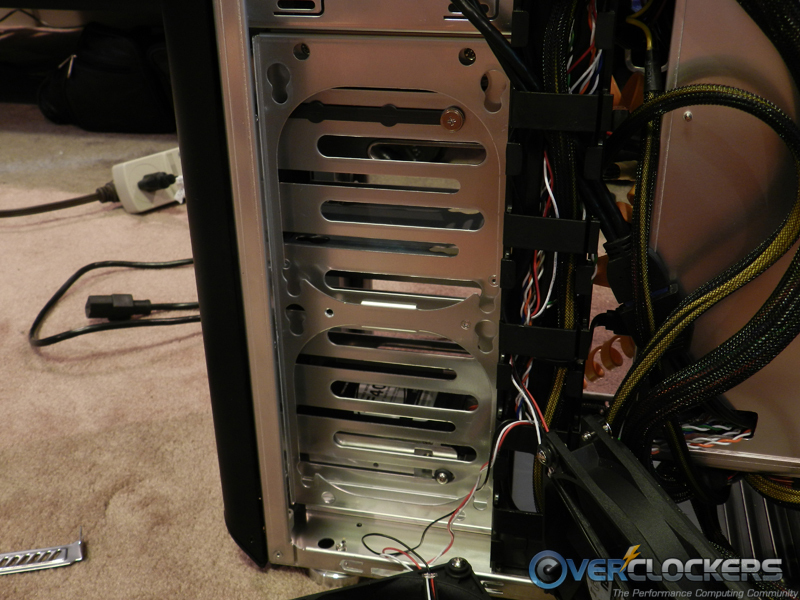 So, Lian Li added a locking mechanism to the front of the case as well. 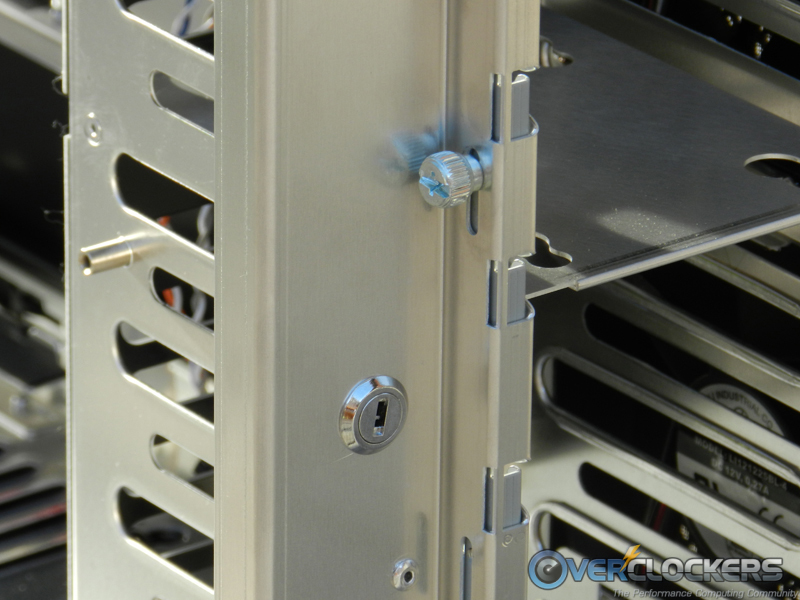 The lock is pretty simple, it’s a sliding piece of metal that covers the slots which the hard drives are slid into. 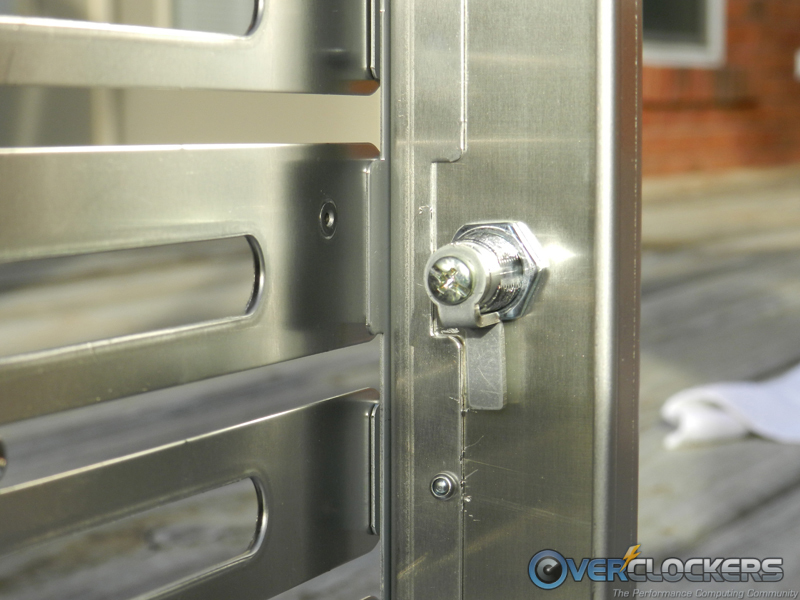 To unlock it for installation or removal of hard drives, the included keys need to be used to allow sliding of the lock, then the thumb screw needs to be loosened to slide down the metal to allow the hard drive to slide in and out. 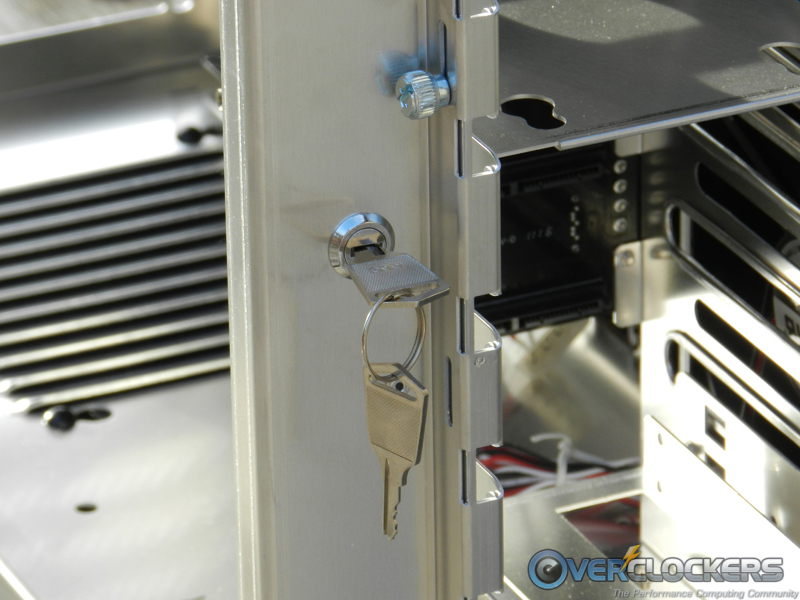 If the keys happen to walk off and can’t be found and the hard drives are locked, then the lock will have to be taken apart to remove the hard drives. Personally, I wouldn’t lock the drives unless I had a reason to be concerned with theft. 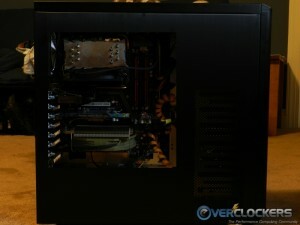 To get access to all the aforementioned areas, the front panel of the case needs to be removed. This was much easier than I had anticipated from experience with other cases. To remove the front panel, all that’s needed is to grab the sides of the panel at the top and pull, no screws or bolts to remove. 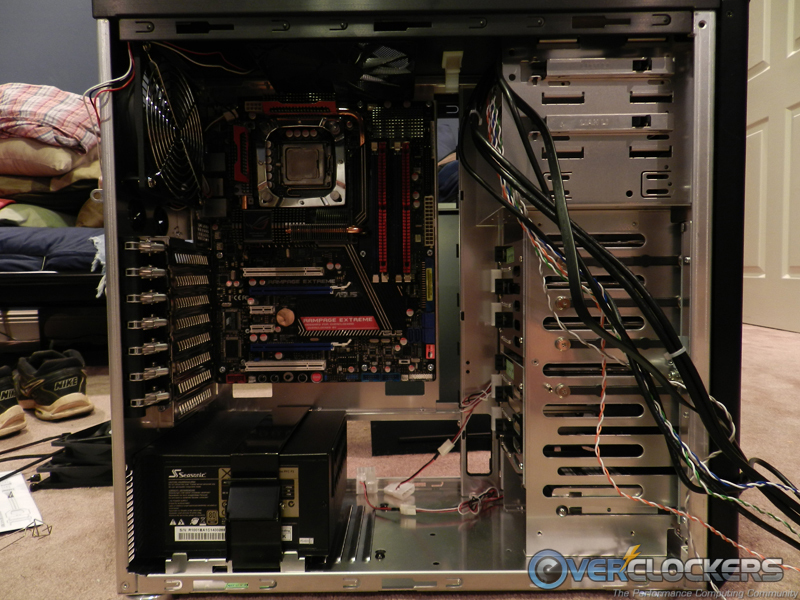 Lian Li knew the front panel would need to be removed more often with the PC-Z60 and they were sure to not make it a hassle. 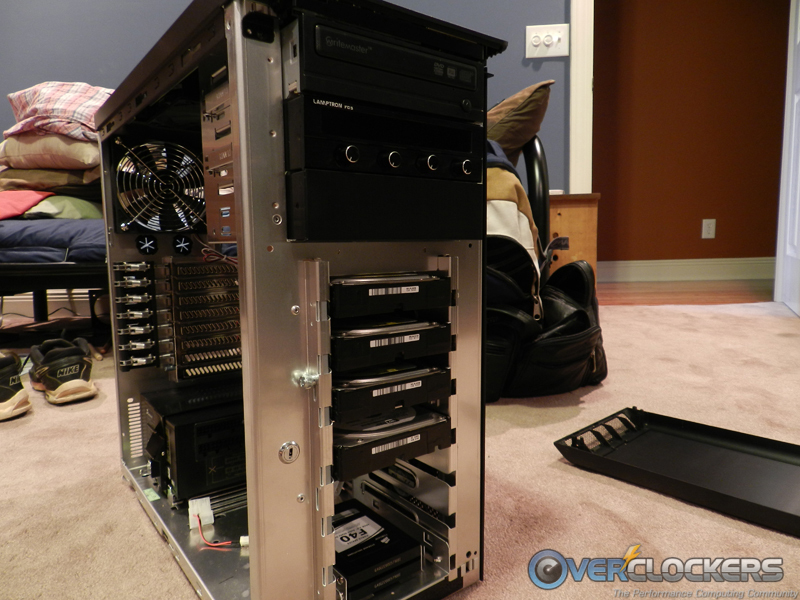 To remove the 5.25″ bay covers, just squeezing on the ends and pulling does the job easily. 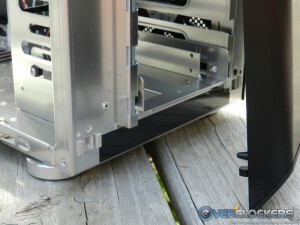 There are two rails topped with rubber for the PSU to sit on, and the bottom vent, mentioned earlier, for air intake. 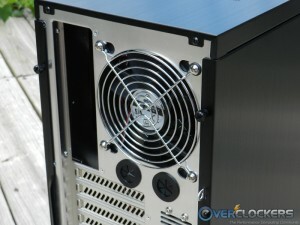 The two rails are raised from the bottom of the case to allow the PSU to get air even if the case is sitting on carpet or if the vent is blocked by some other means. The tool-less PSU mounting bracket is L-shaped with curved ends to catch the case’s frame in two spots. The bracket first goes into a slot at the bottom of the motherboard tray, goes over and around the PSU until the other end can grip a slot in the rail on the other side of the PSU. Then, the “flap” is pressed up and against the bracket to lock everything in place. 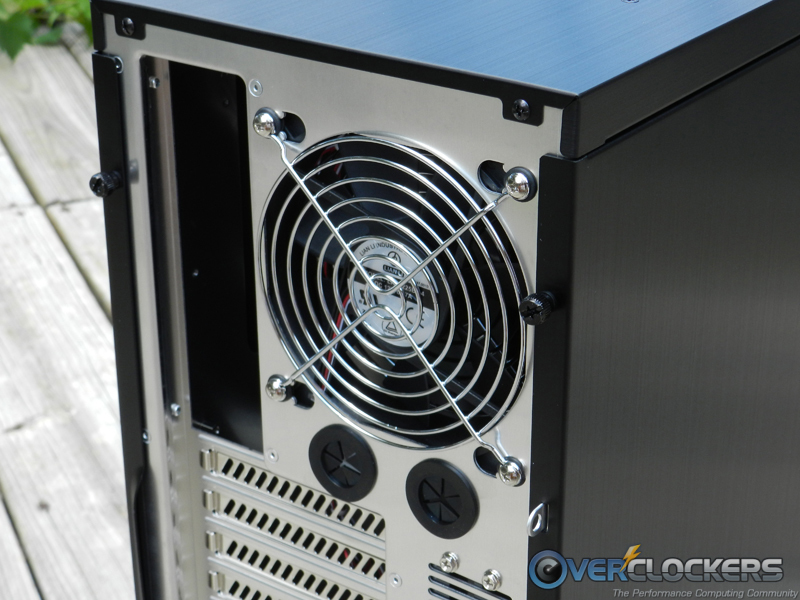 There is rubber along the inside part of the PSU bracket that not only isolates it from the metal of the case, but prevents scratches on the PSU’s finish. This is seriously the easiest PSU installation I’ve ever done, it literally takes ten seconds or less. It’s a very secure installation with the bracket tight around the PSU and nothing will budge, much less come loose. 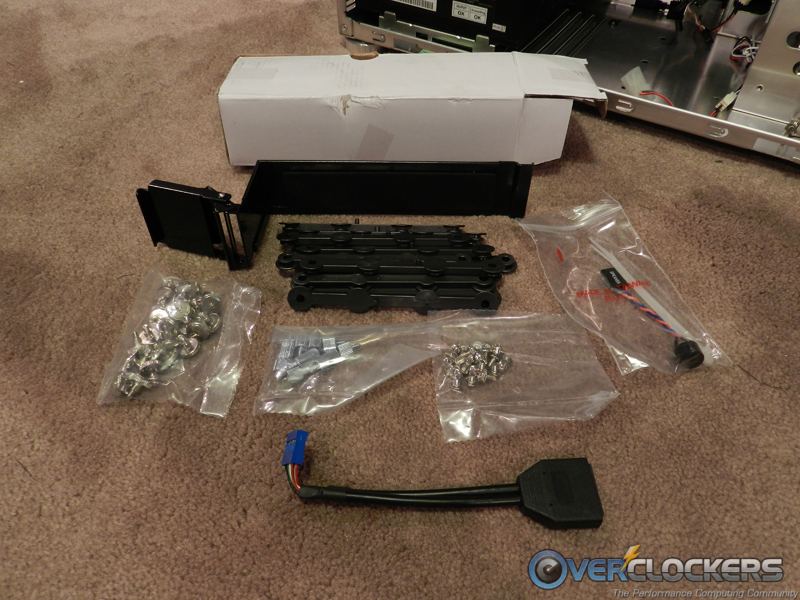 3.5″ hard drive installation is really simple too with more tool-less parts. 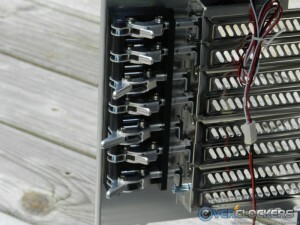 Two rails are attached to each 3.5″ hard drive with four thumbscrews. 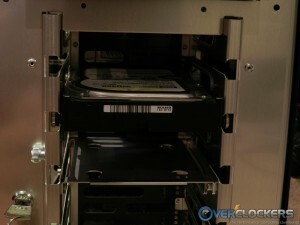 Then the drives just slide into the front of the case and fit securely into the SATA power/data connector in the back of the hard drive cage. Locking the slide isn’t needed, the drives can’t slide out unless the front is removed and they are physically pulled out. 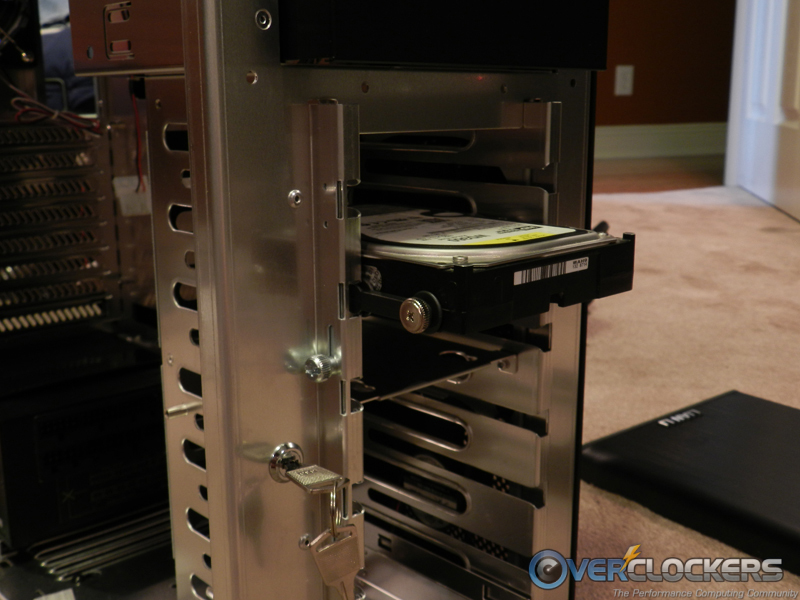 2.5″ hard drive installation takes a little more time since a screwdriver is needed. 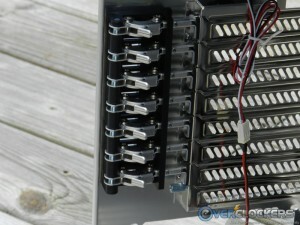 The 2.5″ HDD sled can fit one or two drives, each attached to the sled with four screws. Then the sled slides into the bottom slot just as the 3.5″ drives slide into the other slots. On to the 5.25″ bays for even more tool-less installation. Two of the three 5.25″ bays use latches on one side to keep devices in place. These latches have two protrusions that will fit into the screw holes on 5.25″ devices, preventing them from sliding back and forth. I don’t know why it was decided to leave the bottom bay latch-less and require screws because I think the latches work well and appreciate the ease of installation. In the pictures below, I have an optical drive and a Lamptron FC5V2 fan controller installed with the latches, and I couldn’t pull them out or shake loose the latches. 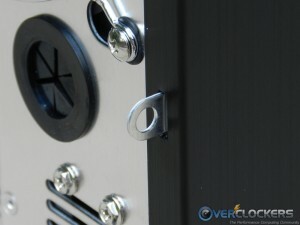 Even the motherboard has a tool-less installation with the extended thumbscrews included with the PC-Z60. Everything went smooth with the board installation, no hiccups at all. The right edge of the motherboard extends all the way to the edge of the cable management hole, so any board wider than the standard 9.6″ will cover that hole. 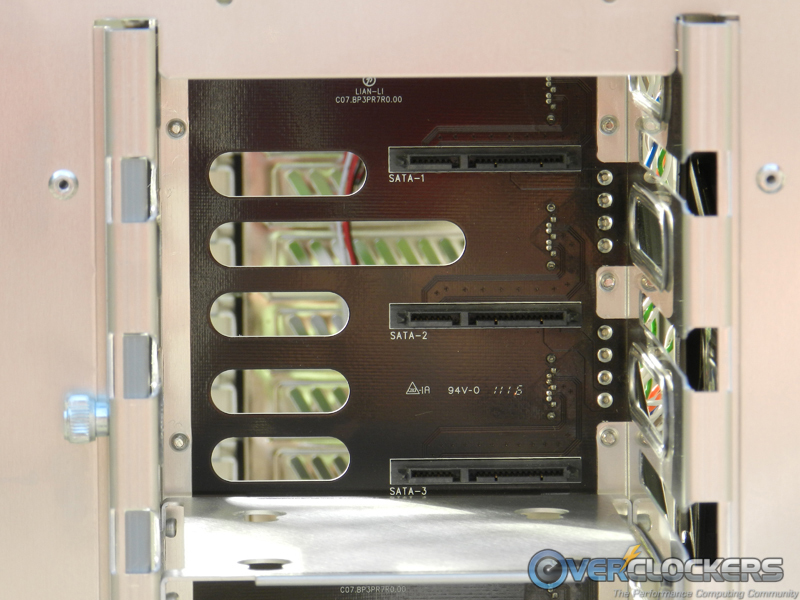 Just behind the 5.25″ bays and hard drive cage, there’s a vertical channel with latches meant for cable management. I took advantage of that as much as possible, and it worked well holding many cables without any of the latches popping loose. Looking at the backside of the motherboard tray, the cutout for heatsink installation seems to be in just the right spot and big enough for the larger sockets. Since we’re on the back side of the motherboard tray, let’s take a look at the two 120 mm intake fans. 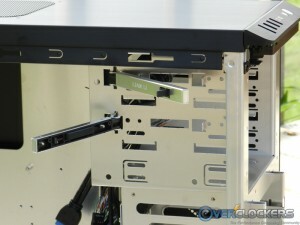 The fans are mounted on a removable mount that can be installed on either side of the hard drive cage. 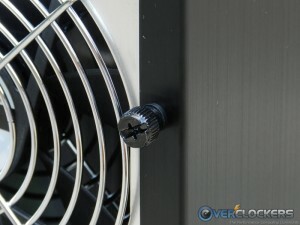 The fans have four screws and grommets on them that makes installation and removal of the fans easy. These fans also have dust filters installed that can be removed simply by twisting. 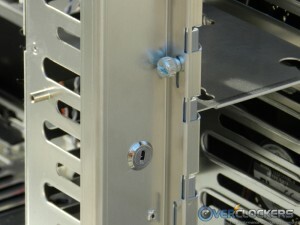 The screws + grommets fit into the holes on the mount, then slide the fans down the mount to secure them. This intake system seems to only be for cooling the hard drives. There are vents on both sides of the case, and the hot swap boards on the back of the cage direct the airflow from one side of the case and out the other. 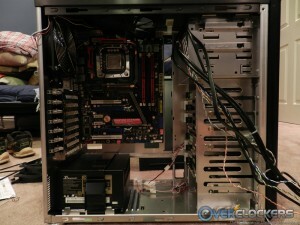 I don’t see how much fresh, cool air can get to the other components like the GPU and CPU heatsinks. Using the highly scientific method of using my hand to feel for airflow, most of the intake air does seem to just flow over the hard drives and out the other side. 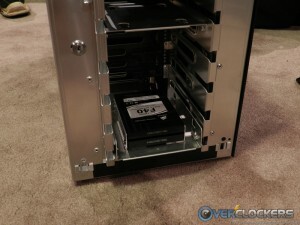 I could feel some air coming out of the holes in the hot swap SATA boards, but it didn’t seem like much at all. Here’s a few pictures of the system up and running. 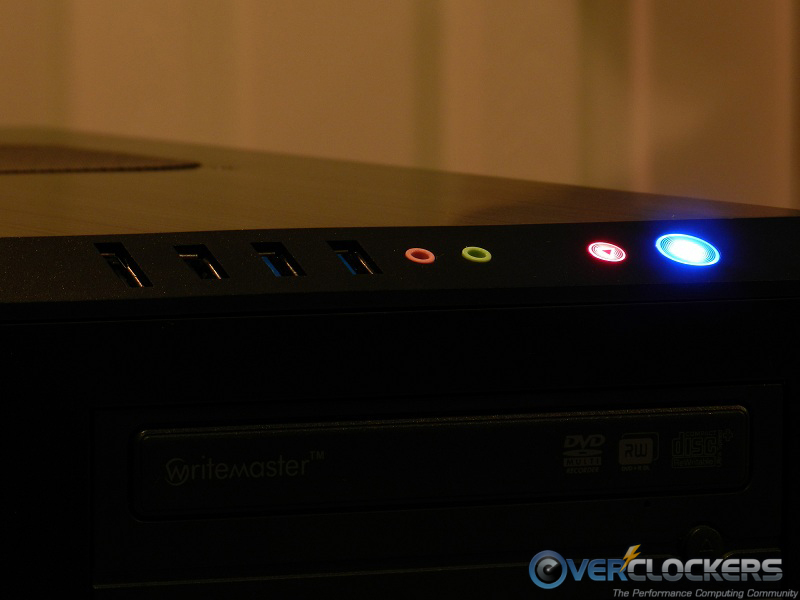 The power button doubles as the power LED and shines blue; the reset switch doubles as the hard drive activity LED and flashes red when the hard drive is in use. 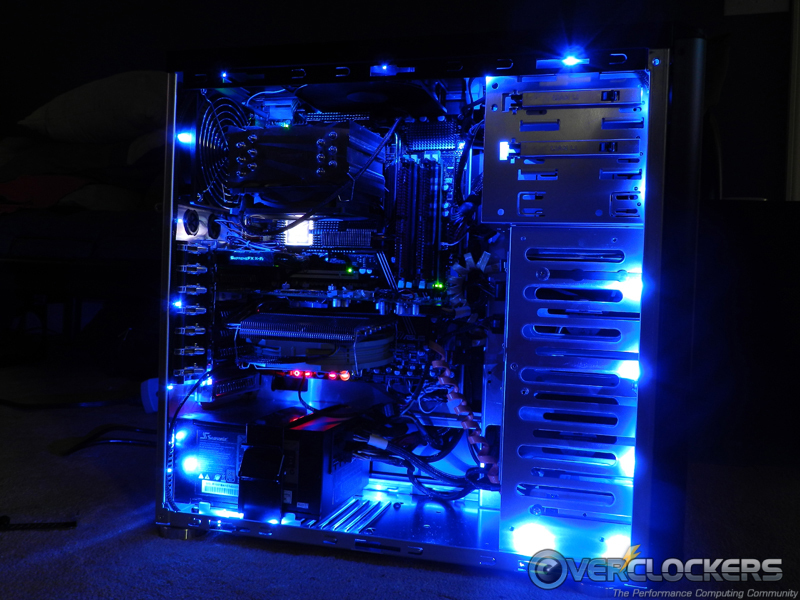 Neither of those LEDs are overpowering, and they won’t keep you awake at night because your entire room is blue and reminiscent of rave parties… However, the NZXT LED strip installed can bring back those memories easily. I think the main reason the NZXT strip is so bright is because the finish of the interior of the case is shiny aluminum; I doubt the LEDs would look as bright if the interior was a matte finish. Two “thin” radiators and 120×25 mm fans in push or pull takes up 110-120 mm of space leaving 75-85 mm of space between the radiators. Two “thin” radiators and 120×25 mm fans in push/pull takes up 160-170 mm of space leaving 25-35 mm of space between the radiators. Two “thin” radiators and 120×38 mm fans in push or pull takes up 136-146 mm of space leaving 39-49 mm of space between the radiators. I didn’t forget about the hard drives. The PC-Z60 has three 5.25″ bays, and for me that means one optical drive, a Lamptron FC5V2, and my hard drive mount that allows two 2.5″ drives and one 3.5″ drive in a single 5.25″ bay. 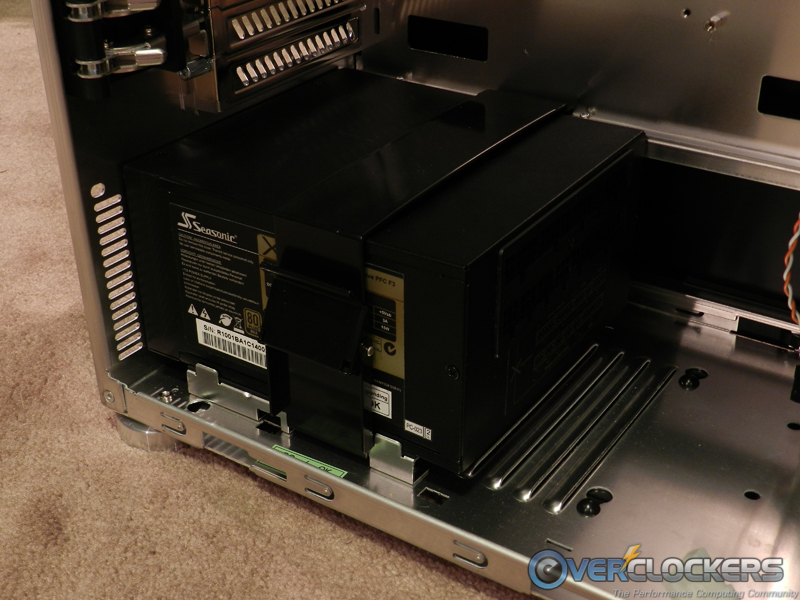 However, having only 5.25″ bays for mounting devices is the downside to that mod. 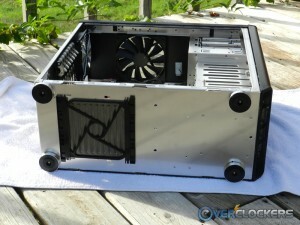 A window mod should be really simple on this case as well. I think a simple square shape would look best, be easy to make, and wouldn’t interfere with the side intake vent. 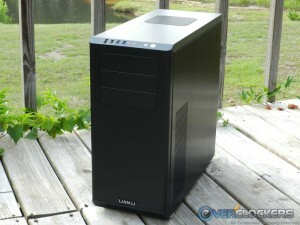 After spending time with this case, I see why so many people praise Lian Li. They do make very high quality cases, and they pay attention to the small details when designing. 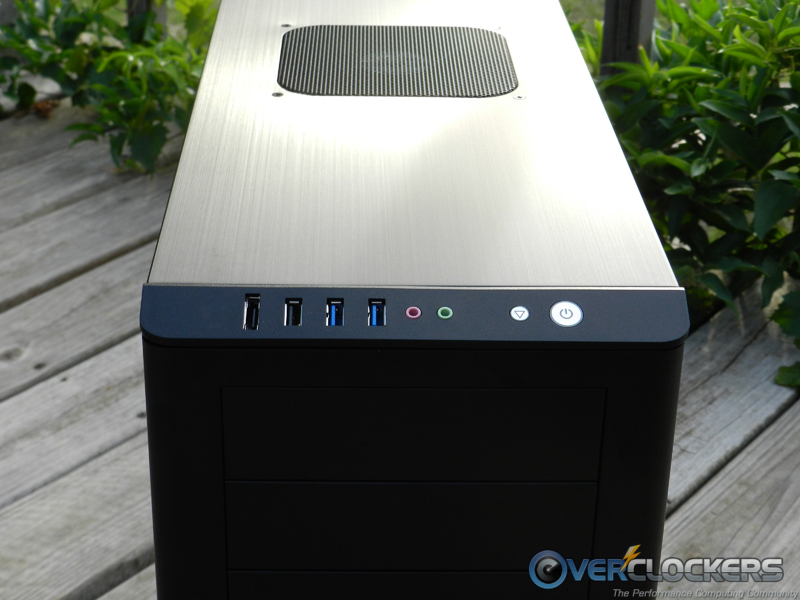 The PC-Z60 is a very simplistic and elegant looking case. I prefer this look over the flashy, clunky style of “enthusiast” cases from some other manufacturers. 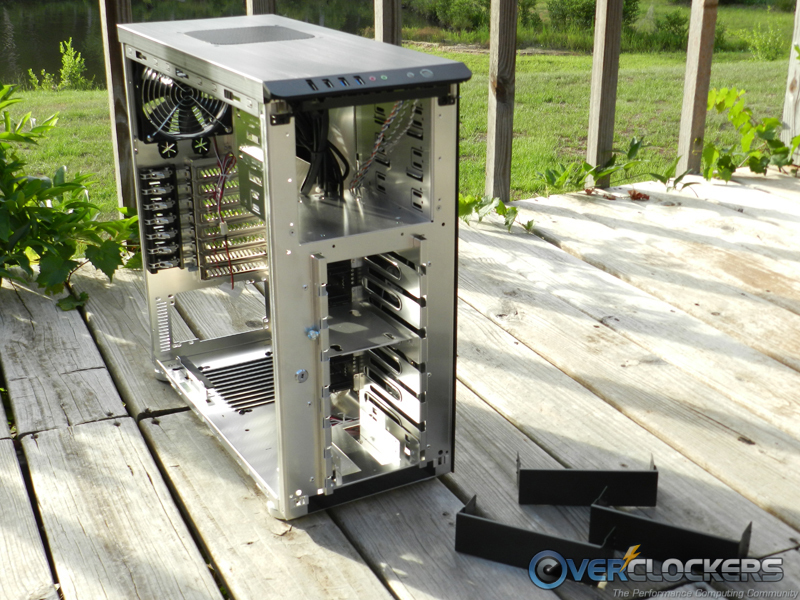 The looks are backed up with the high quality materials to make the case a fortress for your components. 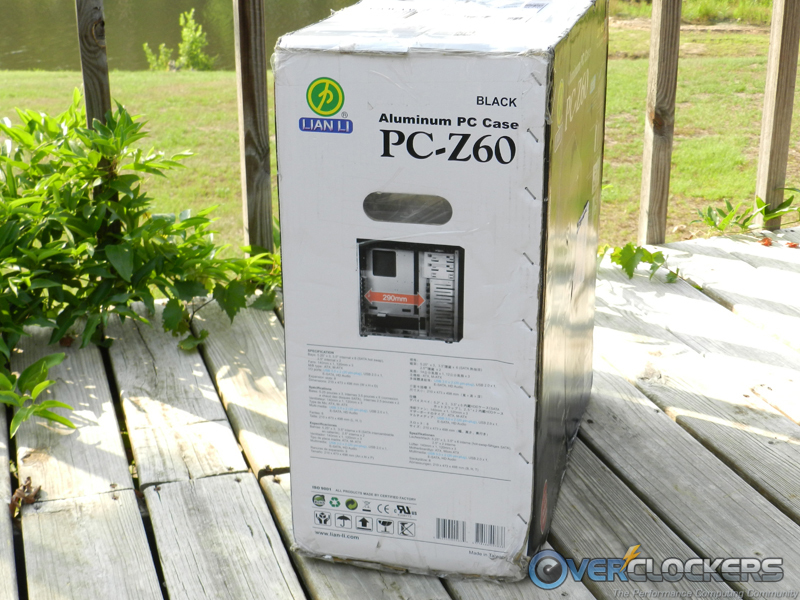 To me, it seems like the PC-Z60 was designed with server use in mind, and they may have included a niche server market whether on purpose or not. 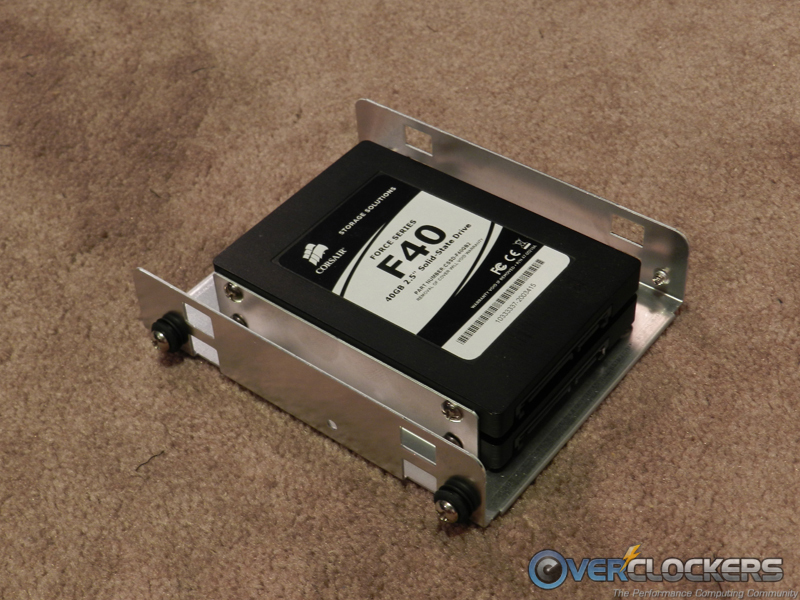 The PC-Z60 makes use of easily removable, hot swap hard drives. 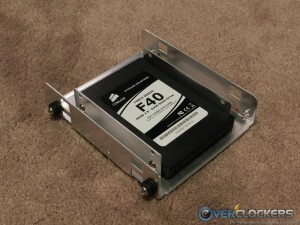 There is more than adequate cooling for the hard drives, so even high RPM mechanical drives will stay cool. There are two locking mechanisms to keep the hard drives and other components safe from theft, unless of course the entire PC is stolen… Most consumers and PC hobbyists do not need those locking features, but I do see a need for that security in a server environment where data is sensitive or important and the owner of the data isn’t always around. One more thing, which in my opinion is the best “pro” about the PC-Z60, is that it’s very easy to make hardware changes due to its mostly tool-less design. I can appreciate this since I’m one who frequently changes hardware and likes to tinker with my PCs. 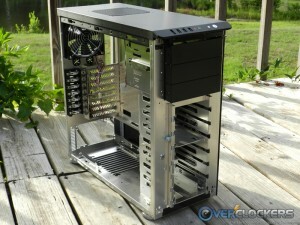 Overall, the PC-Z60 is a good case. It has plenty of features, some more useful than others. I think the range of features brings a versatility to the case which isn’t seen in competitors. It’s a case that would go well with a PC meant to be a server, but is also a good case for the typical daily driver and/or gaming PC. 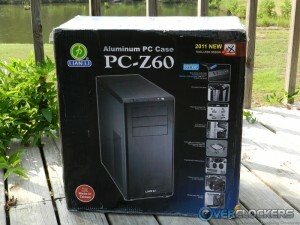 At NewEgg the price tag on the PC-Z60 comes in at $229.99 + $14.99 shipping. Personally, I think the price is a little steep, but that may be because some of the features wouldn’t be useful to me. However, when the build quality and features are looked at again with objectivity, I realize a lot of thought went into the design of the case and its unique features and that definitely helps justify the cost. 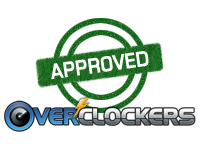 Thanks again to Lian Li for providing Overclockers.com with this review sample! I have a 1x12 board with ceramic tile on it that I set my cases on in my office. I hate carpet and would rip every last bit of it out of my house if I had the cash but I love the PSU intake under the system. 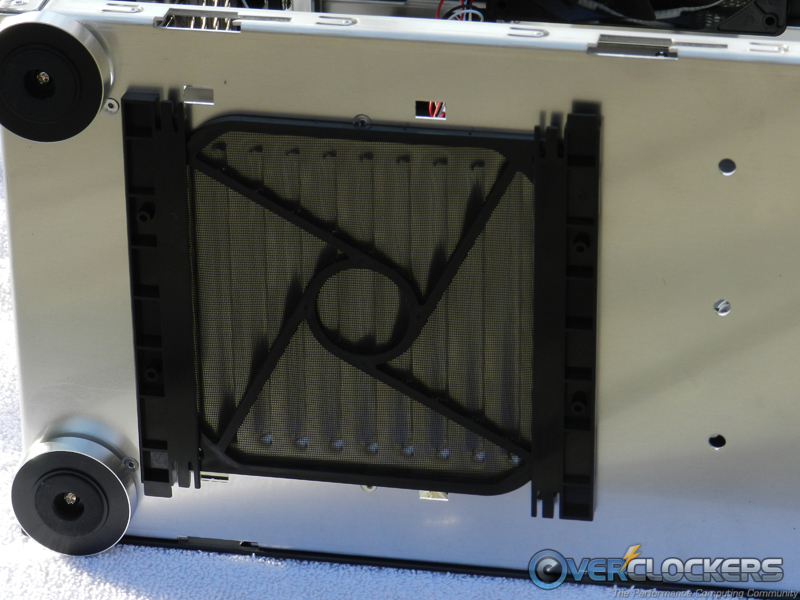 I don't believe a blocked intake vent will have any effect on the PSU getting air because of the following quote from the review :p The PSU is raised ~0.5" from the bottom of the case. 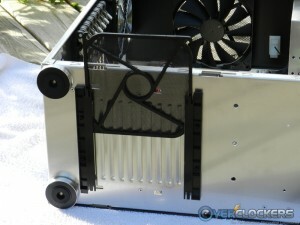 There are two rails topped with rubber for the PSU to sit on, and the bottom vent, mentioned earlier, for air intake. 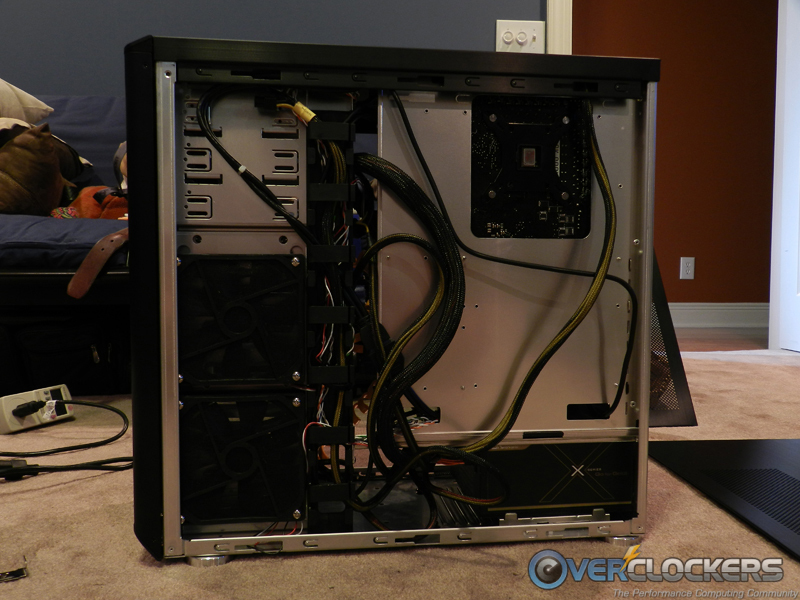 The two rails are raised from the bottom of the case to allow the PSU to get air even if the case is sitting on carpet or if the vent is blocked by some other means. They use the same system in the Lancools also. 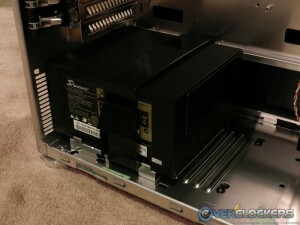 I really like the whole PSU installation system: Isolated by rubber, off the bottom of the case, and completely tool-less. I kinda like the tool-less design too. There a lot of similarities between the Z60 and K62 Lancool designs. Except cost and aluminum. I've said it before but I just can't get over the quality and design of the Lancool K62. 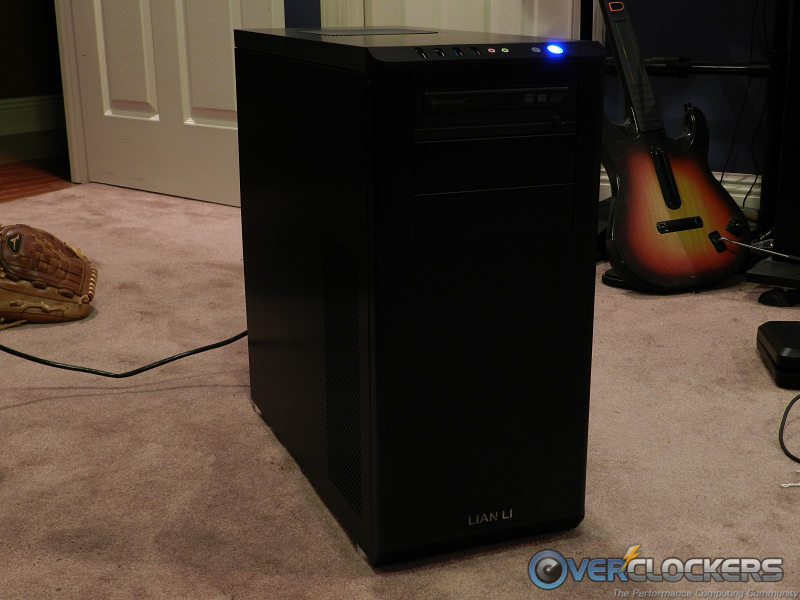 I'm used to buying 200 to 300 dollar Lian-Li cases but I like this Lancool more than any other case I've owned. I'd like to see you review this $99.00 case and get your opinion. 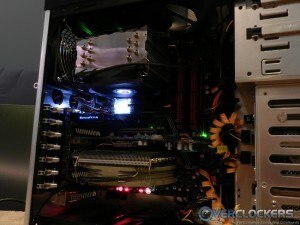 All the fans, PSU, and HDDs are rubber insulated on the Lancool too. For me, price is always a concern. 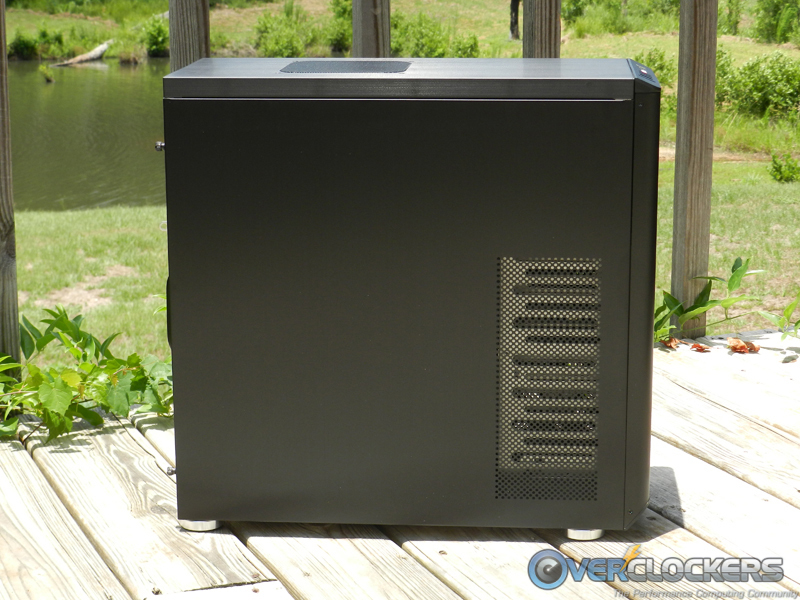 If I'm going to drop big bucks on a case, it better be perfect for whatever I need it for, and then go above and beyond my expectations. 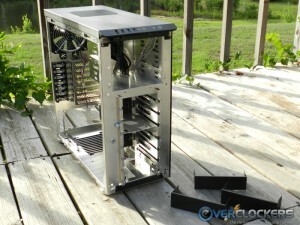 Personally, features/quality per dollar is what I like to see in a case. I see what you mean, but whether or not it's practical is debatable, in my opinion. The majority of desks have a spot for a PC, and not everyone has tall carpet where their PC is located. No matter where the PSU is located, I still don't set my systems directly on carpet. Good review! Currently looking for a new case. Looks like a pretty decent one. 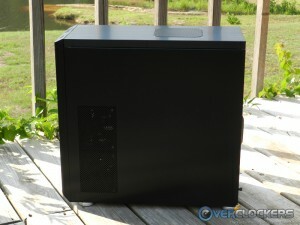 Sweet review :) I'll recommend this case to a friend of mine!